Heavy duty Polyurethane material transfer hose with embedded copper grounding wire. This product is designed to dissipate static electricity when the metal wire is properly connected to ground, through the fitting or other means. CAUTION : This product is designed to dissipate static electricity when the metal wire is properly connected to ground, through the fitting or other means. • Unloading of bulk trucks & railcars in the plastics industry. • Pneumatic conveying systems for powder pellets, and other dry granular material. • Clear polyurethane PVC rein forced hose - allows visual confirmation that material is flowing. Clear body enables operators to inspect hose for contamination during operation. • Smooth polyurethane material - provides resistance to abrasion and minimizes material build up ... provides quieter operation. • Embedded copper grounding wire - prevents the build-up of static electricity ... helps keep material flowing smoothly. 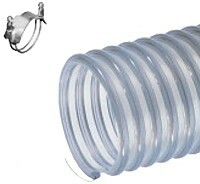 • Exposed clear rigid PVC helix - abrasion-resistant... allows hose to slide easily ... easier to handle.